A major new study on Jumbo produced by the Colchester and North East Essex Building Preservation Trust is now available, and comments are invited. For the first time, great efforts are being made to involve local organisations and members of the public in the future of the famous landmark. The full document can be downloaded from this CNEEBPT web page. You are invited to leave your comments on the above webpage. 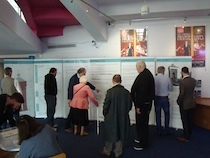 A public consultation event was held at the Mercury Theatre on 20-21st May 2016. 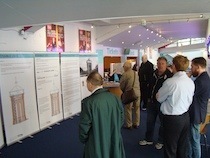 Over two hundred people attended and many completed a questionnaire on their views. Seven options for Jumbo's future are described and evaluated. We greatly appreciate the inclusion of Option 3 in the proposals, which is essentially the scheme currently advocated by BTT. We maintain that, whatever scheme is adopted, the historic interpretation of this fascinating building, and water supply as a topic, must be major features of the restored building, for the enjoyment of the visiting public. We also believe it is vital that original engineering features such as the valves and pipework are restored and highlighted, and that the maximum possible public access to all levels of the tower is provided. Within these parameters, we are willing to work with others to secure the future of this magnificent building for the public benefit.